What do the gift wrapping options include? Don't worry we never include the price tag or invoice. Our Deluxe Gift Wrapped Boxes are $7.95. Whether the baby gift is something the recipient knows about or a surprise the way it is wrapped , creates an air of mystery and intrigue. At Namely Newborn we think that a classic gift box wrapped with paper and tulle is the most elegant way to present a baby gift. The white gift box is lined with pink or blue tissue,professionally wrapped in pink or blue gingham paper, tied with a tuille ribbon, a deluxe card with your message and a $10 gift certificate. Our Deluxe Gift Bag starts at $6.95. A gift bag is a great way of incorporating a lot of items like bibs and stuffed animals along with the main course which is our personalized baby blanket. Many stuffed animals are too big to fit into a box or basket and only look good in gift bags. Our gift bags are white, pink or blue in a high gloss paper featuring an appliqued white crocheted baby outfit. Colorful tissue paper and a deluxe card with your message and a $10 gift certificate are enclosed in the bag. Our beautiful cellophane gift wrapping is $3.95. It includes clear cellophane wrap over beautiful colored tissue tied with tuille ribbon and a deluxe card with your message and a $10 gift certificate. Large gifts like stuffed animals and belly blankets are wrapped in cellophane only and tied with tuille ribbon . Our professionally cellophane wrapped gifts look like a yummy candy and if the gift is personalized, we make sure that the name or monogram is clearly visible. White reusable wicker baskets are an elegant way to send a gift with several items. We can create a themed basket with animals or sports items or build a personalized baby basket in blue or pink for baby boy or baby girl. We can also create gender neutral baskets for baby showers in primary colors or neturals like gray, brown or orange. We try to be green when possble and ship many fed ex ground orders in recycled boxes. All of our gift wrapping is done in our workshop by a professional designer who makes each gift as beautiful as the baby who will receive it. 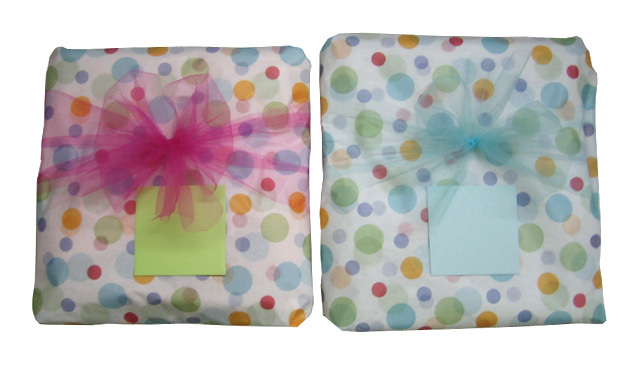 Below are two other cellophane wrapped styles and our gift bags with blue and pink tissue. Check out video which shows you how to wrap a baby gift like candy in cellophane with tissue and curling ribbon which is a great way to present a gift at a baby shower.Deluxe wicker gift baskets are availabe from $15.95 for a small basket to $24.95 for a large basket. Baskets are cellophane wrapped and tied with beautiful bows as shown in the last picture. A deluxe card with your message and $10 gift certificate are included. What does a gift recipient receive if I don't pay for gift wrapping? A standard card with your message, tissue and a $10 gift certificate.